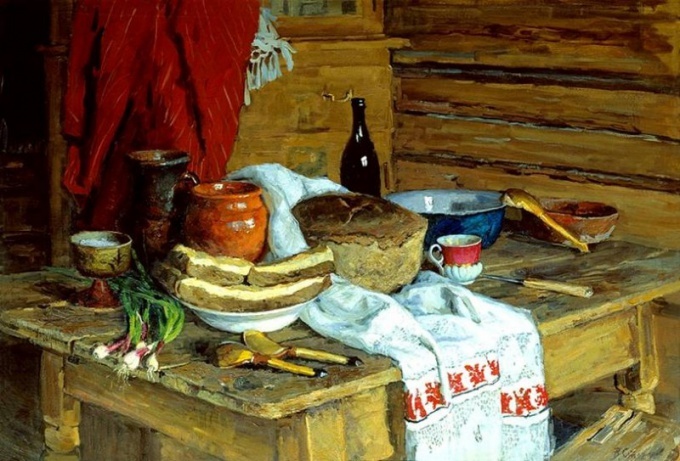 Ture is one of the most simple national Russian dishes. Due to the ease of preparation and basic ingredients ture from time immemorial were considered food of the poor. However, the ture is prepared so far, would brew da bread. This is a tasty meatless meal. Usually it happens when on the table for some reason, no pickles, and you have to do the most simple food. What is this ture? The origin of the word "ture"
If you look at the etymological dictionary, you will find that the word "ture" is a native-Russian and reliable information about the origin is not. Most likely, the word comes from the verb "to RUB", that is "granulate, crumble". If you try to go the way of the associations that first come to mind word of the infant lexicon: "bye-bye" – which means "nothing is missing". Yes, ture is a dish which can be cooked when the house is almost nothing edible left. Just something and I had to crumble the bread, fill it with water and slurp on your health. This is the food of the poor since time immemorial. In a particularly hungry time in the ture put quinoa – herb which is found in abundance in the gardens. Bread crumbs, filled with water, is too primitive. Hardly now someone makes this dish. However, leaving the main ingredients – bread, and the liquid – you can dream up and diversify your table. It is important to note that the ture is prepared just before eating. For the future it has never been done, and should not do. One of the national Russian drink is kvas. Here it's often used for making Turi. To make it tastier, put in the brew is not bread, and toasted croutons in advance. Add a little onion or green onion and a little vegetable oil. This is another simple recipe Turi, who came from time immemorial. If you replace the brew with milk, onions and butter do not add at all, you will get children's ture. Dozens, if not hundreds of generations grew up on this dish. But if you go back to kvass, add more greens, boiled potatoes, egg, you get okroshka, a sister Turi. Eating these meals always cold, and prepared, respectively, in the summer. Hash on the peasant table is often present lean as summer, the meat is rare. Ture can be not only with a bow. It is not a sin to add any vegetables: cucumbers, radish, horseradish, radish, garlic. If you go further, it is possible to prepare the ture on the basis of tomato juice. A similar dish is the Italians. Called "gazpacho". Finely cut and add to tomato juice diced black bread, celery, garlic. Of course, it is necessary to season with salt and drizzle with olive oil. If desired, you can use pepper or some other spices. Ture's perfect food during lent: simple, affordable and, if you do not splurge on components, it is enough calorically. It's funny, but the ture is served in some fairly expensive restaurants of Russian cuisine. Of course, there is bread from the store and cooked crackers, still probably something. But still Turay Turay – a simple, unpretentious dish.